Generations of UM-Flint scholarship donors and recipients "pay it forward" Generations of UM-Flint scholarship donors and recipients "pay it forward"
UM-Flint student Meghan Lucero received a scholarship created by Clarence Sevillian, who received a scholarship created by Dr. Ernestine Smith when he was a student. 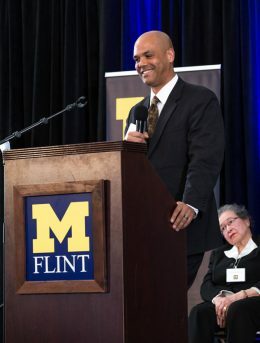 When Clarence Sevillian received the Lavoy C. Smith Memorial Scholarship in 1996, it represented some financial relief while studying at UM-Flint. He and his wife Arteka, also a student at the university, had a young daughter, and the funds helped pay for textbooks. The big picture became clear over time to Sevillian, who is now CEO of McLaren Bay Region hospital in Bay City. Sevillian earned two of his degrees from UM-Flint, including a bachelor’s degree in Health Science in 1997, and a master’s degree in Physical Therapy in 1998. During his career, first as a physical therapist, and then as an administrator, Sevillian continued to feel the impact of the scholarship. 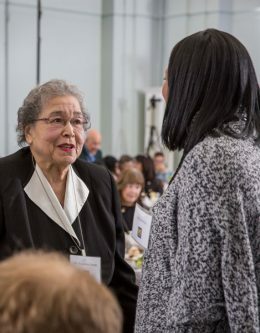 Dr. Ernestine Smith talks with Arteka Sevillian at the UM-Flint Scholarship Recognition Dinner. He grew to know Dr. Smith, and learned about her long career as a physical therapist. She became a mentor, and shared her thoughts about the profession and contributing to the community. “Her giving back and her doing all the things she was driven to do, and have in her heart to do is what encouraged me to do as well,” said Sevillian. In 2016, the Sevillians established an endowment to support the Clarence and Arteka Sevillian Scholarship for physical therapy students at UM-Flint, along with another scholarship for elementary education students at the university. 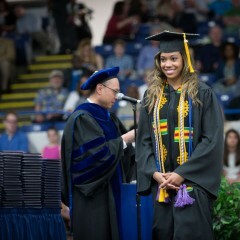 Arteka earned a Bachelor of Science in Elementary Education and a Master of Arts in Literacy Education. She has taught elementary school education in the Flint area for more than twenty years. 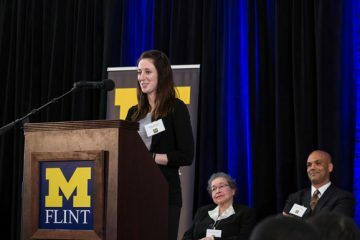 The 15th annual UM-Flint Scholarship Recognition Dinner last month celebrated the generous donors who create opportunities and the outstanding students who benefit from their philanthropy. Speakers Dr. Smith and Clarence Sevillian met Meghan Lucero, the first recipient of the Sevillians’ phyical therapy scholarship. The pay-it-forward spirit is evident in the trio, as Lucero said she would like someday to set up her own scholarship for UM-Flint physical therapy students. “It just goes to show you how important receiving scholarships is for students,” Lucero said about hearing the stories of Sevillian and others. Lucero is a third-year physical therapy student at UM-Flint, and is slated to finish her Doctor of Physical Therapy studies this summer. Lucero said the scholarship will help pay for her books. Clarence Sevillian speaks about receiving and creating a UM-Flint scholarship. An MPH and PhD graduate of UM-Ann Arbor, Dr. Smith worked at hospitals, nursing homes, and within special education settings during her more than 40-year career. 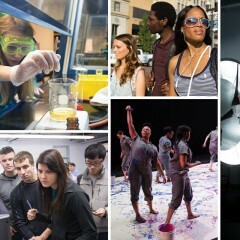 Dr. Smith has established two endowments at UM-Flint, the Lavoy C. Smith Scholarship and the Ernestine R. Smith Scholarship, both of which require academic achievement and community involvement. Dr. Smith continues to be heavily involved within the Flint community, as does her daughter Sheila, who received her MBA from UM-Flint. “Students need help and encouragement, and I have always been actively supportive within the community,” she said. Her volunteer work has included service on UM-Flint’s Citizens Advisory Committee, the Hurley Medical Center Human Resources and Education Committee, and several other community groups. Dr. Smith said she appreciated the opportunity to express her thoughts and reconnect with Clarence at the UM-Flint Scholarship Recognition Dinner.